day to day MOMents: My Baby Is Three! As I type I could remember back to 2008, going through the labor pains, and the million things that went through my mind when the first contractions appeared. I was worried about everything from if his nursery was ready to if I'm ready to be a mom. But once the real strong contractions showed up, I was no longer thinking so much..lol! All I could manage to think was how I needed medications to help me, or I would die from the pain! I had a theory that everyone was making me deliver without medication on purpose, because when I had dealt with the first many contractions on my own, my midwife at the time, was convinced that I can deal with the rest. I was relieved to think that was as worse as it will get, because if I remember correctly I was already seven centimeters when I barely crawled into the doors of the hospital. But once they broke my water I didn't see straight until my son was born. Boy, was I misled about the pain. 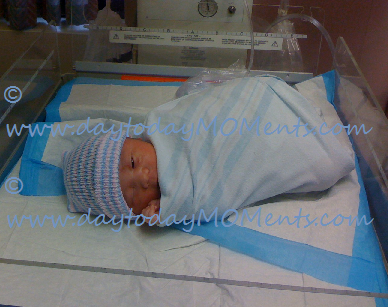 I was at the hospital around four in the morning, and delivered my darling baby boy at 10:16 a.m. But had been dealing with contractions since dinner at around five in the evening. After screaming the whole time, for my mom, I am happy that I didn't get any help and delivered naturally. And I was calling for my mom, but my mom passed away when I was a teenager years ago..but apparently when in need we all call for our parents. When my son turned one I was happy he was a little older, and then when he turned two, I didn't mind too much, because he just got cuter. Now that he is turning three, I feel time is flying by too fast. Once three rolls around, there's no going back to babyville. By his personality, his preferences, and how he expresses himself I already know I no longer have a baby, but time has snuck up on me, I don't know when this all happened!! He will always be my baby of course! He has been so excited, everyday he has woken up asking if it's his birthday. And has asked everyone he comes across if they are coming to his birthday party. I'm so excited that his birthday is here, and happier that his birthday party day is getting closer too. He will be happy to hear that it is his birthday tomorrow when he wakes up, and I'm going to try to make it special for all his expectations and anticipation.